Thumbs up facebook like button next to number 1. We invite you to follow CLEAN on Facebook. Go "Like" our page so you'll stay in the loop! 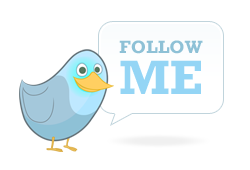 Twitter bird with follow me speech bubble. If you know of something that you think others in the community should know about, just send a tweet to @ClimateLit. You can check out our Twitter page to see what's happening in the community.